Scuba Diving Magazine Publishes “BELCH”! 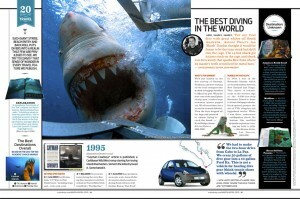 Scuba Diving Magazine chose “BELCH”, one of my most famous images of a great white shark, to illustrate their “BEST DIVING IN THE WORLD” section of their 20th Anniversary Addition in April. The Rodney Fox Great White Shark Expedition is indeed one of the best diving locations left on the planet. To quote Carly Simon, “Nobody Does It Better.” Please contact me for more information about joining my groups on one of my annual trip down under to see the last living equivalent of a tyrannosaurus rex. This entry was posted on Friday, April 27th, 2012 at 5:58 pm	and is filed under Photographer's Notebook, Recent News. You can follow any responses to this entry through the RSS 2.0 feed. You can trackback from your own site.